Here are some snazzy birthday facts about 9th of April 1980 that no one tells you about. Don’t wait a minute longer and jump in using the content links below. Average read time of 10 minutes. Enjoy! What day was my birthday Apr 9, 1980? April 9, 1980 was a Wednesday and it was the 100th day of the year 1980. It was the 15th Wednesday of that year. The next time you can reuse your old 1980 calendar will be in 2036. Both calendars will be exactly the same! This is assuming you are not interested in the dates for Easter and other irregular holidays that are based on a lunisolar calendar. There are 353 days left before your next birthday. You will be 40 years old when that day comes. There have been 14,257 days from the day you were born up to today. If you’ve been sleeping 8 hours daily since birth, then you have slept a total of 4,752 days or 13.01 years. You spent 33% of your life sleeping. Since night and day always follow each other, there were precisely 483 full moons after you were born up to this day. How many of them did you see? The next full moon that you can see will be on May 18 at 21:13:00 GMT – Saturday. Fun stat: Your first one billion seconds (1,000,000,000) happened sometime on December 17, 2011. If a dog named Mcmurphy - a Manchester Terrier breed, was born on the same date as you then it will be 176 dog years old today. A dog’s first human year is equal to 15 dog years. Dogs age differently depending on breed and size. When you reach the age of 6 Mcmurphy will be 40 dog years old. From that point forward a small-sized dog like Mcmurphy will age 4 dog years for every human year. Lucius Septimius Severus is proclaimed Emperor by his troops in Illyricum (Balkans). He marches with his army (16 legions) to Rome. Eighty Years’ War: Spain and the Dutch Republic sign the Treaty of Antwerp to initiate twelve years of truce. The Journey of Reconciliation, the first interracial Freedom Ride begins through the upper South in violation of Jim Crow laws. The riders wanted enforcement of the United States Supreme Court’s 1946 Irene Morgan decision that banned racial segregation in interstate travel. Kosovo War: The Battle of Košare begins. What does my birthday April 9, 1980 mean? 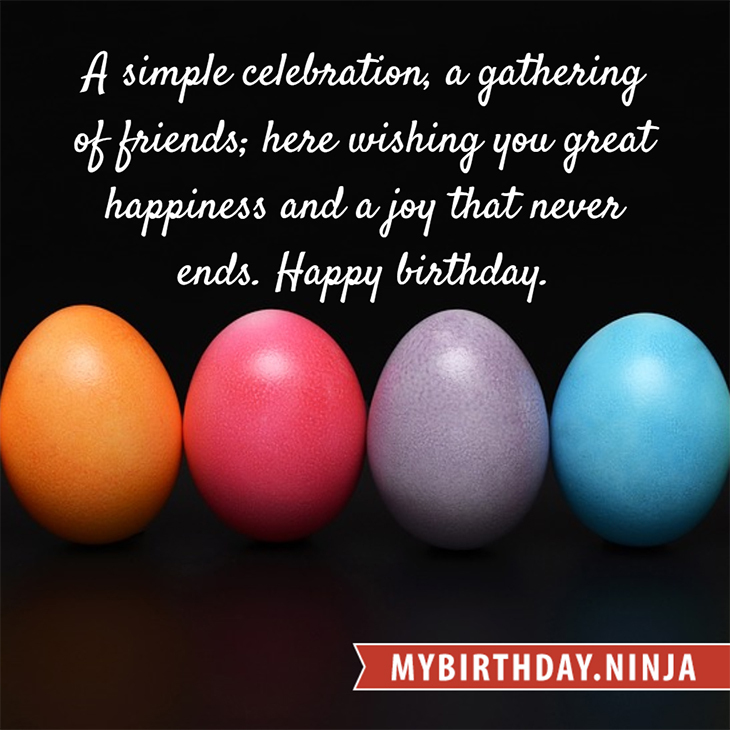 Your birthday numbers 4, 9, and 1980 reveal that your Life Path number is 22. It is a master number that represents practical idealism and material mastery. You were born under the most powerful and potentially the most successful of all Life Path numbers. The following celebrities also have the same life path number: Liu Yifei, Rich Little, Erina Ikuta, Joe Butler, Gerry Marsden, Terri Nunn, Eleonora Rossi Drago, Shin Dongho, Samantha Harris, Julia Perez. 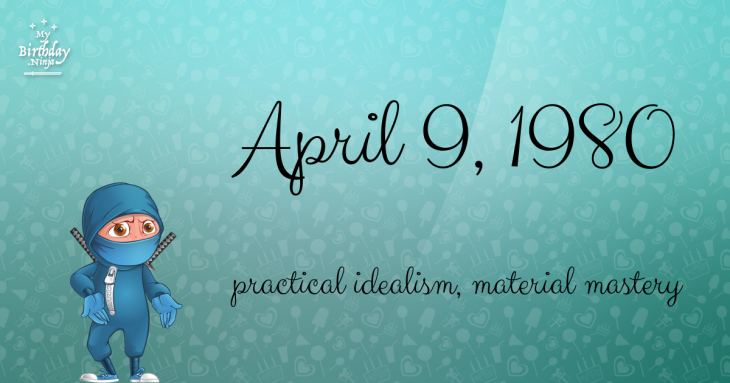 What is the birthday horoscope for Apr 9, 1980? The Western zodiac or sun sign of a person born on April 9 is Aries ♈ (The Ram) – a cardinal sign with Fire as Western element. The ruling planet is Mars – the planet of war and ambition. According to the ancient art of Chinese astrology (or Eastern zodiac), Monkey is the mythical animal and Metal is the Eastern element of a person born on April 9, 1980. Fun fact: The birth flower for 9th April 1980 is Sweet Pea for love. What is the Love Match for Apr 9, 1980? When it comes to love and relationship, you are most compatible with a person born on January 16, 1984. You have a Love Match compatibility score of +137. Imagine being in love with your soul mate. On the negative side, you are most incompatible with a person born on February 20, 1996. Your incompatibility score is -140. You’ll be like a cat and a dog on a love-hate relationship. Arf-arf, I want to bite you. Meow-meow, stay away from me! The number-one hit song in the U.S. at the day of your birth was Another Brick in the Wall, Part II by Pink Floyd as compiled by Billboard Hot 100 (April 12, 1980). Ask your parents if they know this popular song. I do not know how you feel about this, but you were a male ♂ in your last earthly incarnation. You were born somewhere around the territory of Germany approximately on 1275. Your profession was jeweler, watch-maker. How many babies were born on April 9, 1980? Base on the data published by the United Nations Population Division, an estimated 125,148,676 babies were born throughout the world in the year 1980. The estimated number of babies born on 9th April 1980 is 341,936. That’s equivalent to 237 babies every minute. Try to imagine if all of them are crying at the same time. What is the popular baby name on 9 Apr 1980? Here’s a quick list of all the fun birthday facts about April 9, 1980. Celebrities, famous birthdays, historical events, and past life were excluded. Try another birth date of someone you know or try the birthday of these celebrities: January 14, 1998 – Ai Moritaka, Japanese model and actress; October 26, 1981 – Girl Talk, American DJ and producer (Trey Told 'Em); November 28, 1991 – Mayuko Kawakita, Japanese-American actress and model.